This was a must win game for Annan against a Berwick team who prior to the game held the upper hand over Annan and the other teams in the battle for a top four finish. Annan did not disappoint their fans with a 4-2 victory but the road to victory displayed the two sides of Annan which can explain why they are not up there in contention to win the league. They are just not consistent enough to be considered as serious title contenders. Berwick were put through the ringer in the opening half with Annan deservedly storming to a three goal interval lead leaving Berwick with a mountain to climb in the second half but the Borderers came remarkably close to overhauling Annan’s lead reducing the lea-way to 3-2 with 4 minutes to play before Annan finally put the game to bed with an 88th minute penalty. Annan started the game brilliantly and were ahead in 4 minutes after Flynn played a superb ball wide and inviting for Hopkirk who’s first time low cross was perfectly weighted for Stuart McColm to slam the ball into the roof of the net from 8 yards. It was a superbly worked goal and it was only the starter for the best 45 minutes football displayed by Annan this season. Four minutes later and Annan doubled their lead. It was the same build up play as the first goal with Hopkirk’s darting run down the right ending with a fine cross field ball to the opposite wing with McColm collecting the ball eluding the challenge of Jacobs to cut along the bye line finishing with a low near post cross which Josh Todd side footed into the net from 2 yards. Annan continued to sustain pressure on the Berwick defence but on a rare escapade from defence Berwick displayed their potential when they created a good opening in the 23rd minute. Ross Drummond won his way to the bye line, finishing with an inviting ball across the 6 yard line which eluded everyone. Annan struck again in the 35th minute , Matty Flynn was once again at the heart of the move bringing Hokirk into play and his cross field ball once again picked out Stuart McColm who finished with a low shot across the face of the goal and past the diving arm of William Bald and into the corner of the net. There was minor action around both goals but nothing in comparison to what we had been treated beforehand. It was without doubt the best 45 minute team performance displayed by the Annan this season. Berwick Boss Colin Cameron made an initial change minutes before half time and another one at the interval and the changes had a positive effect on his teams second half performance and unlike the first half it was Berwick who were very much pulling the strings and dictating the play in the second half. Darren Lavery was a threat and in the 61st minute he went past a couple of challenges finishing with a low shot which Mitchell brilliantly saved. Berwick were very much in control but Annan defended resolutely until late on when their rearguard was breached. Annan had a scare in the 74th minute when Mitchell spilled a low cross and on a rare foray up field a deft Weatherson header from a Josh Todd cross went narrowly past the post. Craig Dargo the half time substitute carried a threat down the right and was the main outlet for Berwick’s attacking moves was denied a certain goal by a brilliant Alex Mitchell save low down but minutes later Dargo was at the heart of Berwicks 80th minute goal when he shrugged aside the challenge of Swinglehurst to set up Paul Willis who latched on to the cut back to score a fine goal from close range. The goal had been on the cards for a while and presented Berwick with a life line but as Berwick pressed forward they left themselves exposed at the back. In the 85th minute Flynn squandered a glorious opportunity and almost immediately at the other end Berwick struck again. Dargo was the provider when his cross from the right fell invitingly for ex Annan player Blair Henderson who’s well placed header was perfectly placed well beyond the reach of Mitchell to cut Annan’s lead to a single goal. Berwick then committed match suicide when Stephen Tulloch upended Annan substitute Rabine Omar who picked the ball up wide on the right and his pace forced Tulloch into the challenge. Weatherson converted the penalty to secure three important league points for Annan. The action was not over and Matty Flynn had a great opportunity when one on one with keeper William Bald who pulled off an important save to ensure there was no more scoring. 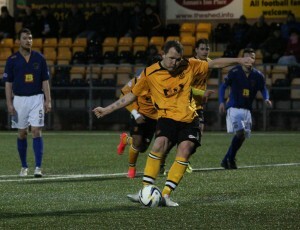 The victory ensures Annan are still in with a chance of making the play offs along with Berwick. Annan’s away form has been dismal this season and with their next 2 matches away to Montrose and Clyde it is essential that Annan take something from these matches if they are to retain a serious interest for a top four finish. Annan – McColm 4 min, 35 min, Todd 8 min, Weatherson 88min. ANNAN ATHLETIC: Alex Mitchell, Keiran Brannan, Steven Swinglehurst, Martin McNiff, Peter Watson, Ryan McStay, Josh Todd, Matty Flynn ,Peter Weatherson , David Hopkirk, Stuart McColm (Rabine Omar 84 min). SUBS NOT USED: Jordan Hart GK, Steven Black, Steven Logan, Trialist, Trialist. BERWICK RANGERS : William Bald, Devon Jacobs (Blair Henderson 82 min), Ross Drummond, Steven Notman, Johny Fairburn, Stephen Tulloch, Paul Willis, Lee Currie, Andrew Russell (Craig Dargo ht), Darren Lavery, Scott Maxwell (Ross Gray 42 min). Substitutes Not used David Gold, Michael Andrews GK, Dean Horribine, Colin Cameron.